A native of Philadelphia, Andrew Einhorn now makes his home in New York City. He got into photography as a student at Temple University where he worked on the school newspaper and yearbook. 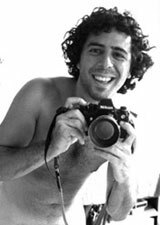 After working for the Philadelphia Inquirer as a photojournalist for five years until he moved to New York in 1994. This was when he stated shooting nudes of his friends and models. These were incorporated into a TV show that he stated producing called Dog the Cat. Naked Happy Girls was his first book. When not working with his camera Andrew does stints as a videographer, editor, and even as a comedian.